Hello, we’re the Royal Norfolk Regimental Museum (RNRM) based at Norwich Castle. We’ll be writing monthly blogs about what the Norfolk Regiment was doing this time a hundred years ago during the First World War. Every month we’ll introduce you to a star object from our collection that tells the story of the Norfolk Regiment in the First World War. For August, and the beginning of the war, we have chosen this letter from Lance Corporal Sidney Smith to his family. Here at the RNRM we have a collection of letters written by Sidney to his family between May 1914 and 29th July 1916. There are more of Sid’s letters on display in the Regimental Galleries at the Castle. Sid was already a regular or professional soldier in the 1st Battalion of the Norfolk Regiment when war broke out in August 1914. The 1st Battalion were a regular battalion, and had been stationed at Holywood Barracks in Belfast during that summer. 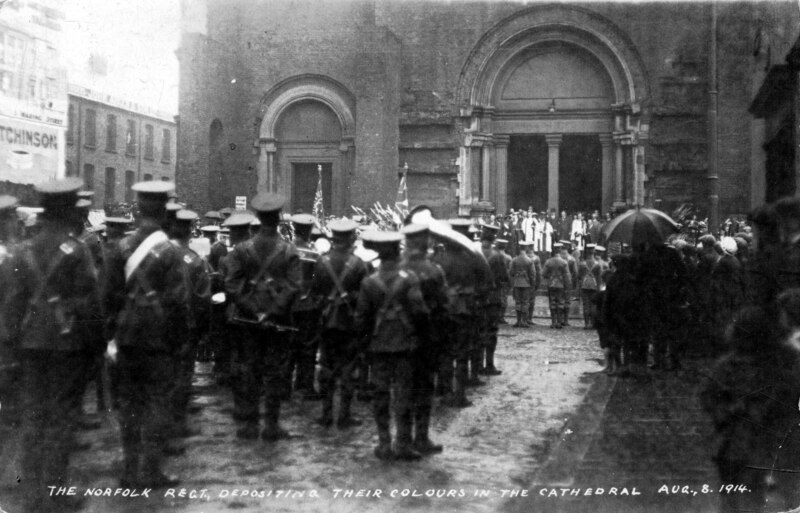 The 1st Battalion depositing the Regimental Colours at Holywood Cathedral. For the regular soldiers this transition from peace to war was something that they had practiced for many times, but for young soldiers like Sid the war was the first time that they would come face to face with the real enemy. Sidney Smith never did come back “alive and kicking” to his large family in Upwell, Norfolk. He went to France as part of the B.E.F (the British Expeditionary Force or “Old Contemptibles”) and was involved in fighting at Mons, the Ypres Salient and the Somme. 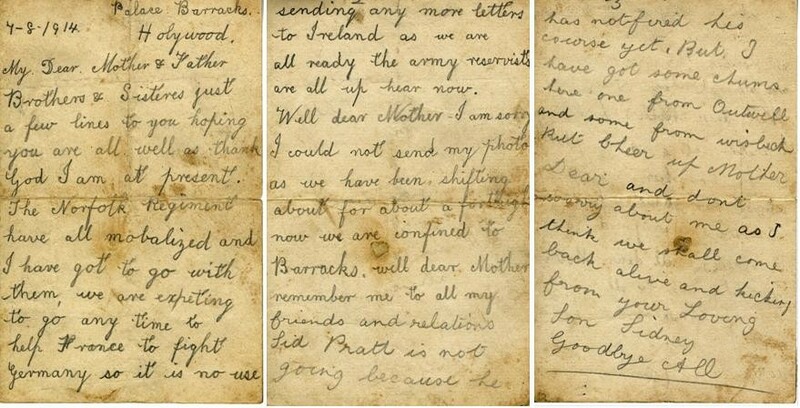 Sid’s last letter to his mother tells her that his brother Bert, also a soldier with the Norfolk Regiment, was missing, but not to worry and that when they met the previous week they had shaken hands and wished each other well. In fact, Bert had been killed in action. Sid was killed soon afterwards, on July 31st 1916. 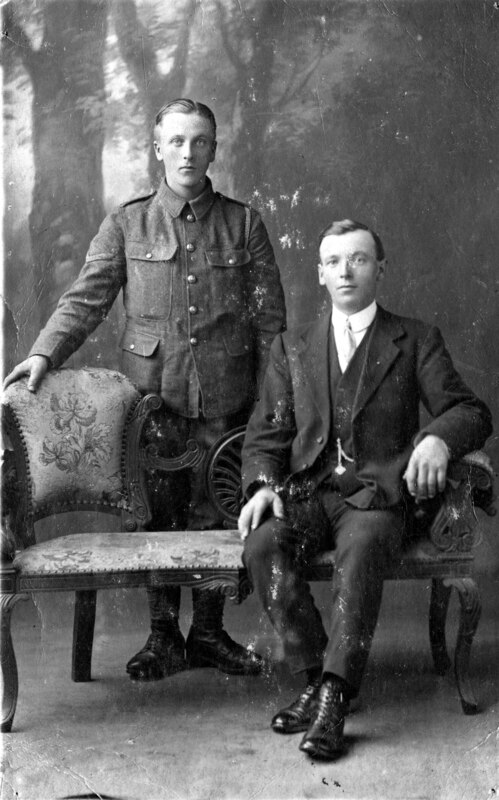 Sidney Smith standing, and his brother Bert seated. The RNRM holds a large collection of First World War objects, documents, diaries and letters, like this one written from Sid to his family. As part of the First World War centenary commemorations, the RNRM will be providing local history research sessions in which the collection can be explored. Please call 01603 493640 for more information. Is there still a link to the audio transcript of these letters from Sidney? thanks for getting in touch, it is so nice to find that people are reading back through our posts. Contacting the Norfolk Regimental Museum directly will probably be the fastest way to find our about this. They are currently in the last stages of putting a large exhibition together so it may take a little while for them to get back to you. However this was also a project including the Norwich Theatre Royal and my colleague here thinks that any audio output may be linked to them. The project featured the late John Hurt so they will hopefully have records.